come join us for the first ever poetry cruise. take poetry workshops and enjoy a caribbean cruise. this special cruise will sail May 27, 2006. it will be a year from now but these things fill up fast, so make your reservations really early. more info, HERE. Hitchhiker's, originally uploaded by carbonator. Yes, like Geof Huth, I was bored by the Sith'th movie by George Lucas. 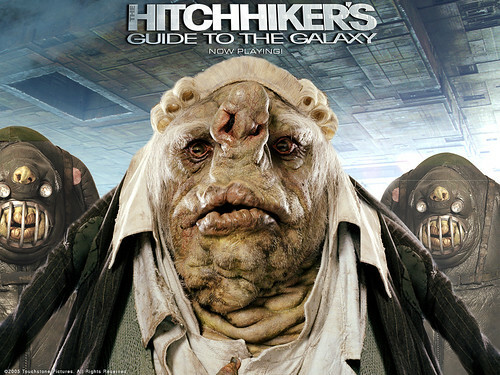 Then I went to see the Hitchhiker's Guide to the Galaxy and it astounded me with its visual appeal and its intelligence. Yes, intelligence wins over the "force" anytime. carbonator blog among those top blogs featured in Poetry Magazine's exclusive web content! Poets also talk to each other, or at least hear each other talk, via weblogs. The love of poetry, writing about it, self-promo, procrastinating in order not to write poetry, or at least of getting attention any old way you can, has prompted hundreds of poets to blog. Leaving to sociologists the question of why so many would write so much prose for no pay, or keep diaries in public, I'll admit there's entertainment and some learning to be had visiting po-blog-world—and a danger of feeling like you're in a corner looking at the wall while the rest of the world happens without you."